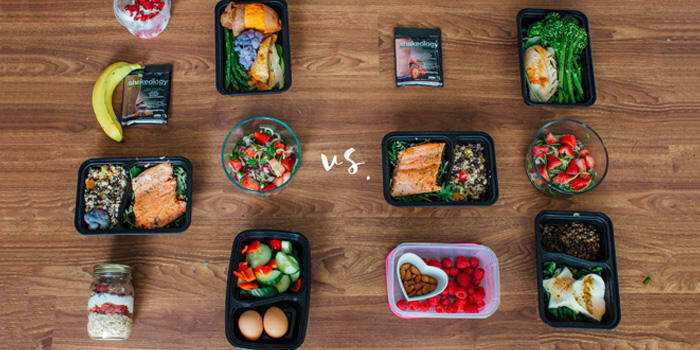 We’ve shown you a lot of ways that one person can meal prep for a week, but what if you want to meal prep for two people with different caloric needs? 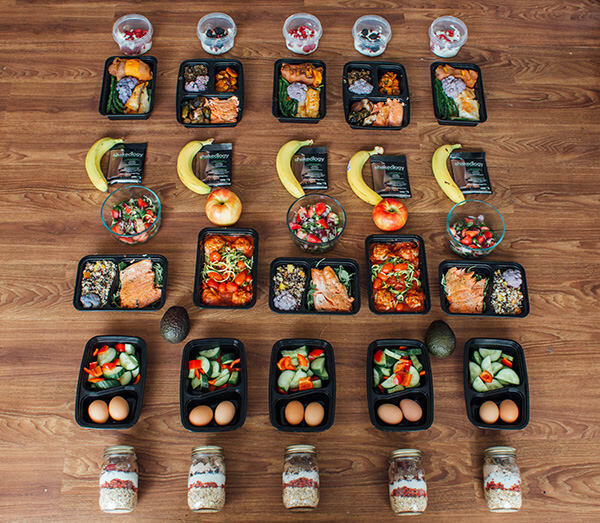 Meal prep goes faster – and we think it’s more fun – when two people share the work in the kitchen! 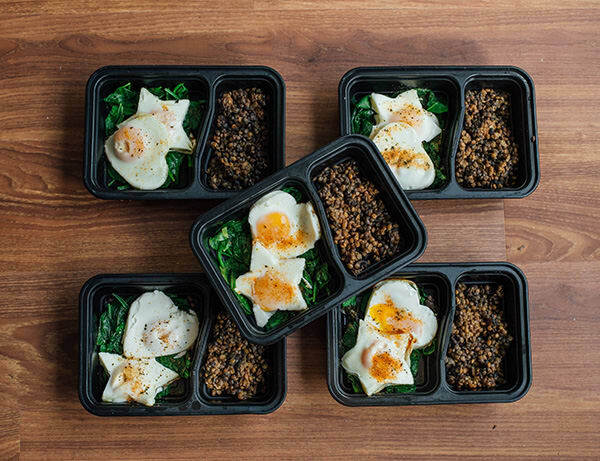 So grab your workout buddy and use this satisfying meal prep for two and accompanying grocery lists to inspire your menu this week. Amanda follows the 21 Day Fix Meal Plan and eats at the 1,500–1,799 calorie level. Her friend Chris follows a similar meal plan for The Master’s Hammer and Chisel at the 2,400-2,699 level, about a thousand calories higher! Our two meal preppers planned out their meals for the week and made a comprehensive grocery list for both. (We’ve included separate grocery lists for each menu, so you can use the individual meal plans if you’re cooking for one). They made shopping easy by dividing and conquering; while one gathered produce and proteins; the other picked up dry goods and pantry items. 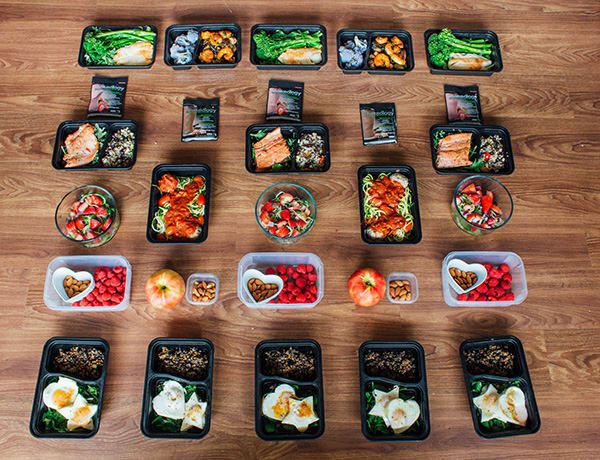 Amanda and Chris chose different breakfasts and snacks, but to save time and money, they cooked all of their lunches and dinners together in bulk. To do this, they baked all of their proteins at once, and made large batches of vegetables and salads to share. Here are more great ideas for make-ahead breakfasts, tasty snacks, and hearty dinners you can make in bulk. Eating 1,500–1,799 calories per day might not sound like a lot, but when the ingredients are as nutrient-dense as these, they become a full day of hearty meals and snacks. 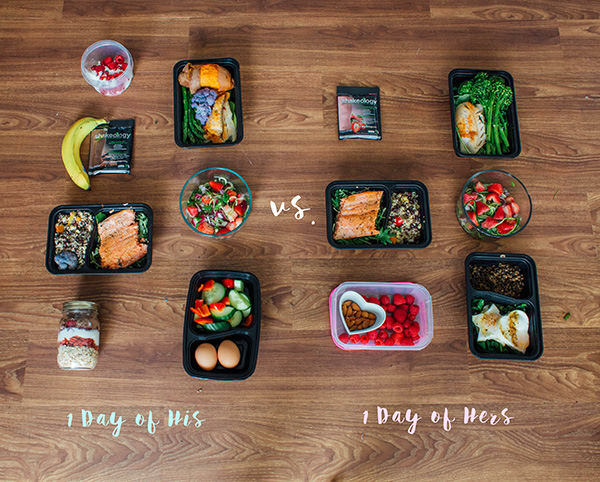 Because she follows the 21 Day Fix Meal Plan, Amanda doesn’t have to count those calories. Instead, she measures her foods using color-coded portion-control containers. This week, Amanda made a large pan of baked eggs that she cut using adorable cookie cutters, a Black Bean and Quinoa Salad recipe from the FIXATE cookbook, and a spiralized cucumber salad recipe from Inspiralized. Meal 3 (Lunch M/W/F): 4 oz. Baked wild-caught salmon cooked with ½ tsp. olive oil // 1 cup Quinoa and Black Bean Salad made with quinoa, black beans, three colors of bell peppers, corn, cilantro, and cumin-lime dressing (recipe in the FIXATE cookbook equivalent to ½ green, 2 yellows, and 1½ tsp.) // 1¼ cup spiralized cucumber, 1 cup strawberries, cilantro, ¼ cup red onion, and 1 tsp. honey – 2 greens, 1 purple, 1 red, 2 yellows, 2 tsp. Meal 3 (Lunch T/Th): 4 oz. turkey meatballs and ½ cup marinara sauce over 2 cups zucchini noodles sautéed in 2 tsp. olive oil with 1 cup white beans and ½ apple – 2 greens, 1 purple, 1 red, 2 yellows, 2 tsp. Meal 5 (Dinner T/Th): 4 oz. shrimp sautéed with 1 tsp. olive oil, ½ cup Brussels sprouts and ½ cup purple cauliflower roasted in 1 tsp. olive oil – 1 green, 1 red, 2 tsp. A person can easily scarf 2,600 calories in one meal at some restaurants (we’re looking at you, fettucini alfredo). Meal 2 (Snack M/T/W/Th/F): 2 soft-boiled eggs with a salad of 1 cup cucumber, ½ cup bell pepper, ½ cup cherry tomatoes, ¼ avocado, 1½ tsp. extra virgin olive oil, balsamic vinegar, served with a medium orange – 2 greens, 1 purple, 1 red, 1 blue, 1½ tsp. Meal 3 (Lunch M/W/F): 4 oz. baked wild-caught salmon // 1 cup Quinoa and Black Bean Salad made with quinoa, black beans, three colors of bell peppers, corn, cilantro, and cumin-lime dressing (recipe in the FIXATE cookbook equivalent to ½ green, 2 yellows, and 1½ tsp.) 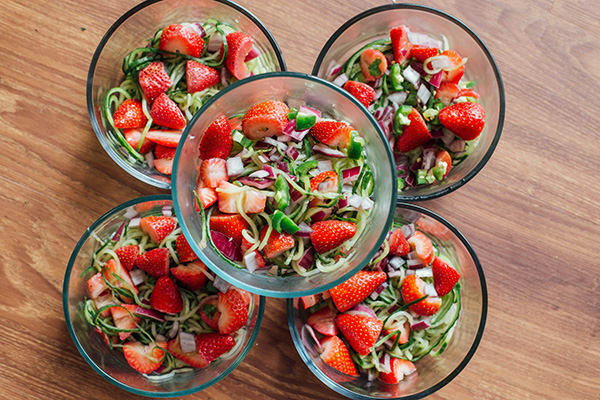 // 1¼ cup spiralized cucumber, 1 cup strawberries, cilantro, ¼ cup red onion, and 1 tsp. honey – 2 greens, 1 purple, 1 reds, 2 yellows, 1½ tsp. Meal 3 (Lunch T/Th): 4 oz. turkey meatballs and ½ cup marinara sauce over 2 cups zucchini noodles sautéed in 1½ tsp. olive oil with 1 cup white beans and ½ apple – 2 greens, 1 purple, 1 red, 2 yellows, 1½ tsp. Meal 4 (Post-workout Snack M/T/W/Th/F)): 1 scoop Chocolate Shakeology, 1 large banana, 2 cups spinach, 2 tsp. coconut butter – 2 greens, 2 purples, 1 red, 2 tsp. Meal 5 (Dinner M/W/F): 4 oz. baked cod, 1 cup asparagus sautéed in 2 tsp. olive oil, ½ cup baked sweet potato – 1 green, 1 red, 1 yellow, 2 tsp. Meal 5 (Dinner T/Th): 4 oz. shrimp sautéed with 1 tsp. olive oil, ½ cup Brussels sprouts and ½ cup purple cauliflower roasted in 1 tsp. olive oil, and ½ cup lentils – 1 green, 1 red, 1 yellow, 2 tsp. *If you find that you are still hungry after dinner, or wake up feeling famished, it may be helpful to eat a small protein snack at the end of the day. Chris added Greek yogurt with a little bit of fruit for sweetness. Instead, you could incorporate Beachbody Performance Recharge before bed with slow-release protein to support your body’s recovery overnight. His: Overnight oats with Strawberry Shakeology, Greek yogurt, raspberries, hemp seeds, and chia seeds. 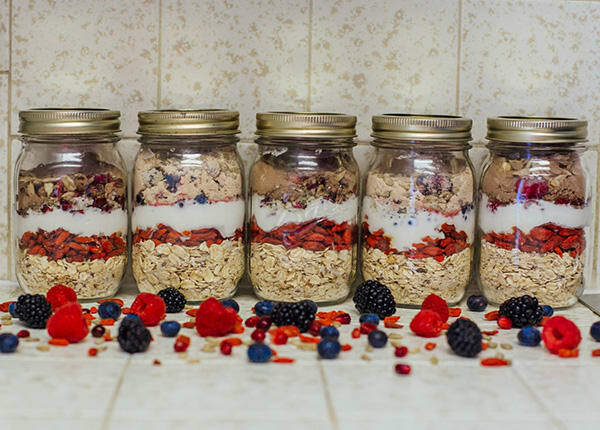 To make, simply combine all of the ingredients in a jar and refrigerate overnight. Hers: Two baked eggs with sautéed spinach, side of berries (not pictured), and lentils. To make your baked eggs in cute shapes like Amanda did, crack all of your eggs into a baking dish coated with nonstick spray. Bake for 15–20 minutes at 350° F until set, and then cut the eggs into individual portions using cookie cutters. You can also use muffin tins to bake eggs. His and Hers: This colorful salad features spiralized cucumber with avocado, strawberries, cilantro, red onion, and honey (if you look closely, you might even see chopped jalapeño in the photo, which is optional). Topping salads with berries, apple slices, or citrus is an easy way to add more fruit to your diet. Her Dinners: Amanda keeps it light in the evening with high-protein, low-carb dinners. 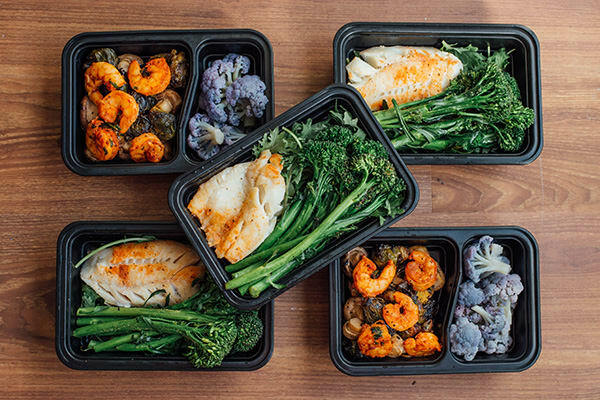 This week, she ate either baked cod with broccolini, or sauteéd shrimp with Brussels sprouts and purple cauliflower. 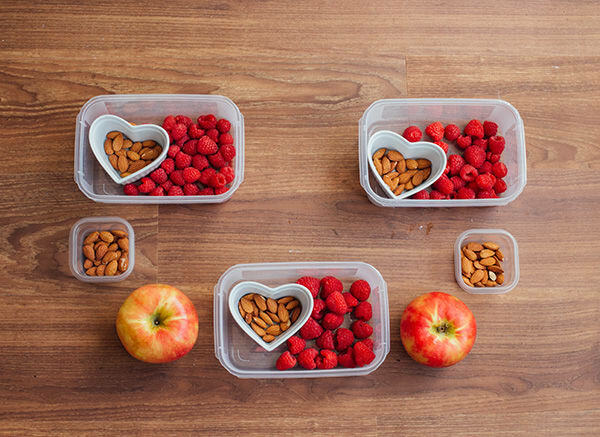 Hers: She paired fresh fruit with raw nuts for a snack she could take anywhere.